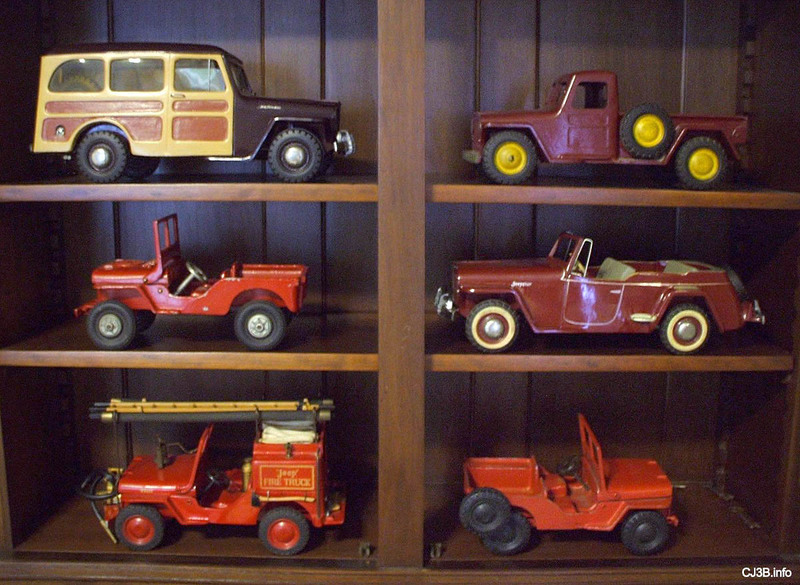 One of the nicest collections of the foot-long Al-Toy Aluminum Toy Jeeps from the 1940's, turned up in a posting on the old Jeep Toys Bulletin Board. 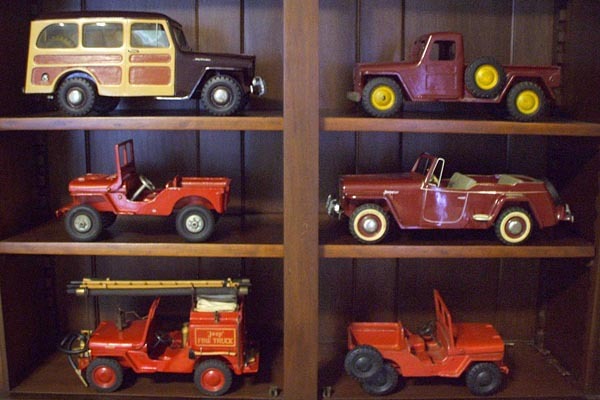 Terry Smith of Michigan had these Al-Toys for 25 years; they originally came from his uncle, who was comptroller for Willys-Overland in Toledo, and they have always been in a display case. Terry told CJ3B.info in 2003 that "As a small child I always admired these vehicles; in fact when I would ask my uncle if I could play with them he would say no, they were just to look at." Al-Toy collector Glenn Byron commented in 2003: "This is the most exciting event to happen in the Al-Toy world in years. Accurate information about the Al-Toy program is very scarce. Very few people seem to know much about it and most of those do not share their knowledge very well. We must also remember most of this took place more than 50 years ago and the folks directly connected to the program are gone. But here we are and out of the blue comes a cherished family heirloom to share with us on CJ3B.info! "Terry Smith's situation is the direct factory link to Willys and the Al-Toy program. These were handed down from a Willys executive. Remember, most of these toys were never available outside the executive circle at the Overland (as the factory is known). Finally, we now have examples to compare and study. Each has been guarded from little hands and preserved unlike any I've ever seen." Terry mentioned how unusually complete the CJ-2A fire engine is: "The Fire Truck has the overhead ladders and hard hoses, the coiled fabric hoses and small tin ladder in the back compartment, an ice spud and shovel still taped to the rear bumper. There is an axe hanging on each side, a pump and hose on the front (the hose is fragile, possibly dry rotted). There is a bell on the hood with its pull string still attached. It also has a simulated fire extinguisher in the driver's area. The tires say AL-TOY. Paint is perfect." See a front view photo (30K JPEG) showing the pump and hose. Glenn: "The Fire Truck was the last of the Al-Toy Program. For Christmas 1949, they outdid themselves with trinkets. Just look at all those little parts to lose over 54 years. I have never heard of this little ladder in the back! I think the white hose in the back was folded in the area under the big ladders, and the front pickup hose was folded in the back. Look at that yellowed scotch tape holding those tools to the back. How much more original than that can you get? Supposedly only 50 of these were done and I have talked with a collector who claims to have seen the invoice. But this does not mean that a later order could not have been placed." Glenn: "Christmas 1948 brought us the beautiful Station Wagon model, even though the real one had been in production since 1946. 1949 stickers front and back, along with tiny "Jeep Station Wagon" decals on each side of the hood and a bold "Willys Overland" decal on the back, make this an impressive toy. Several pieces screwed together with plastic windows, wire wipers and door handles along with the wood effect paint job, shows us that the crew at Toledo Brass could put out a good product by 1948. Most sources say that about 300 of these were done, and we have some evidence that the Wagon was also used as a reward to salesmen, and incentives when the Factory wanted to impress someone. Of the four of these I have, it appears there are two different casts and the parts do not mix well. Inside on the roof is a #1 or #2. Maybe someone else will tell us more. At Hershey a few years back I bought several reproduction front bumpers. Frequently the bumper is missing, as is seen on the Jeepster in Al-Toy Aluminum Toy Jeeps on CJ3B.info. As all can see, Terry's Wagon has lived a very protected life." Glenn: "The pickup was the Christmas Gift for 1946, and the ugliest of all the set. We wonder why Toledo Brass was chosen for the job. Certainly it was not their toy making skills. We can only guess maybe a family connection. The first toy in the set for Christmas 1945, the CJ-2A single seat, was very fragile but a beautiful job. For the pickup at least they made it more durable but still used those fragile wheels. Terry's example, protected all its life, shows the wheel center weakness. I have four pickups in my collection and evidentally there were different casts made of the pickup. I have been told that the pickup was available to the public, but because it was so ugly and broke easily it was not popular. On eBay recently I bought a tailgate reproduction, and the molds also. Only problem -- it's too good! The original tries to show W-O script but fails." The Jeepster sports car was produced by Willys from 1948-51. Probably the most esoteric of all Jeeps, the full-size VJ Jeepster is prized by a dedicated community of collectors. See also a top rear view (30K JPEG) of the Al-Toy Jeepster. Glenn: "The gift for 1947. What a thing of beauty! Either Toledo Brass learned from their earlier efforts or they brought in some help. Still a very fragile toy, but what you see here is one of the most sought-after toys at least in Willys circles. Those whitewalls were simply painted onto the same fragile Al-Toy wheels. These same wheels were used throughout all the toys, though threaded inserts were later used to make them a little more durable. Notice the hubcaps. These are chair glides simply pushed into the wheels. I wish I could find replacements which match the curve of the original. New ones are too flat. This same item was used on the wagon also, sans whitewall. Gosh this toy is perfect! That stripe was hand done, but the dash gauges must have been screened. I wrote an article about the Jeepster several years ago for the Willys Overland Jeepster Club; I have two of these, but not as nice. The bumpers are very fragile. This toy has several parts such as seats, whole nose, and grill attached with rivets and screws. Just imagaine your dad bringing one of these home from work and not letting you play with it. "Well, this collection is as perfect as I've ever seen, and I hope everyone realizes how fortunate we are to have a peek. Let's not stop here. We need to know what parts have been reproduced, what has been written about these toys, who are the other lucky owners and anything else about this program we can find out. What I have written here and beforehand is not cast in stone as to accuracy. Just observations of 20 years of chasing these obscure toys." The red CJ-2A from Terry's uncle's collection is a 1950s Oglesby casting, which differs slightly from the Al-Toy models. Most notably, the headlights are attached to the hood rather than to the grille. Terry points out some of the other details which identify it as an Oglesby: "The red Jeep says 'Willys' on the tires and has the Star on the hood, and it also has an engine under the hood." Glenn: "This whole discussion started on the Bulletin Board with the question of values. Terry lacks only the #1 CJ to complete his set, and I'm sure the chase is on. As many know, the old security guard from the Overland sold his set in the mid '90's for about $7500. I held these toys in my hot little hands and I can tell you they did not compare to what you see here. Probably those paint chips came from that big lunch box (only kidding)." 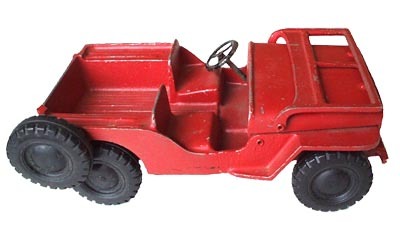 This Al-Toy CJ-2A, seen in the photo of the collection at the top of the page, was added to the collection later, to complete the Al-Toy range. Not in the same mint condition as the other Al-Toys, it shows a bit of wear and tear, but is notable for its black wheels -- no paint on the hubcaps. This green Oglesby was previously in the collection. Terry says, "All these vehicles were from my uncle except the green Jeep and trailer. It is in good condition, however it's missing the left rear hub cap. I acquired this one from an antique shop in Northern Indiana. I liked it because it reminded me of the red one, plus the trailer. The paint shows it's been played with since there are several spots showing bare aluminum." Note: As of 2018, the Jeeps from the collection have been offered individually on eBay at prices ranging from over $1000 to over $3000 but have not yet been sold. See more information on Al-Toy and Oglesby Jeeps on CJ3B.info.